Late this afternoon the NAACP passed a resolution calling on all people — including tea party leaders — to condemn racism within the tea party movement. Delegates said they wanted to make it clear, however, that the resolution wasn’t indicting the entire tea party movement as racist. Other Tea Party members are going further to protest against the resolution from the NAACP. Posted in Humor and Satire, Republicans. Tags: Racism, Tea Party. RSS feed for comments on this post.. TrackBack URL. The teabaggers are the most ridiculous and easily manipulated people in the country. 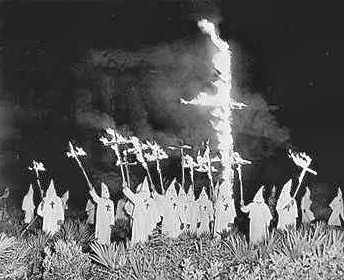 RT @TopsyRT: NAACP Condemns Racism In Tea Party Movement #p2 http://bit.ly/b0oXY3 Tea party members wear white sheets an hats. KKK!!!! I’m willing to give the Tea Party a tremendous amount of benefit of the doubt and say that they’re not necessarily institutionally racist and that many of the racist comments/actions have been isolated and unsanctioned by its leadership. I think the far bigger concern is the effect its policy suggestions will have on African-Americans. The effect, in short: not good.